Patrick Johnson Still A Hurricane? I read the message boards, I get caught up in the whimsical decisions of 17 year old kids as much as the next Hurricanes’ fan. Patrick Johnson is as good a recruit as Miami has had commit in years. He has great size for a corner yet can run with the best of them. Recently, PJ opened up his recruitment. It started with the trip to LA for USC’s “Rising Stars Camp” where he dominated and cemented his stance as the top defensive back in the nation. The trip opened some eyes, and PJ’s commitment. Don’t worry about it. Johnson is a competitive kid who wanted to prove he is the best in the nation. Let the Gators, Trojans, and even Aggies (yes, Texas A&M fans think they actually have a shot with this kid) have their flights of fancy. Johnson will be a Hurricane. 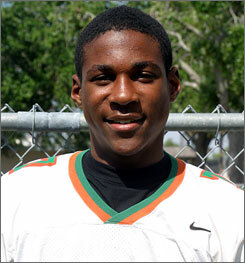 Patrick Johnson is just like every South Florida kid. He wants to see the country. Take some visits. Hell, I saw He Got Game. If I knew I could travel the country to college campuses getting introduced to the local talent, I’d take every visit I’m allowed. And apparently moms wants some fun too.